The retro-inspired T-Shirt designs are available strictly at the Apple Park Visitor Center. They herald a growing trend toward vintage looks. Apple is going retro with some new logoed merchandise. 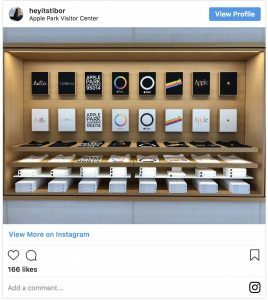 The global technology company recently released new branded apparel that’s exclusively available at its Apple Park Visitor Center in Cupertino, CA. As 9to5Mac noted, three of the autumn collection’s designs appear to take their inspiration from vintage 1980s Apple styling. Apple aficionados will note that the rainbow-colored “hello” script from the 1984 Macintosh features on both a white T-Shirt and a black T-Shirt. Meanwhile, at least two other tees depict the retro Apple logo surging upward across the chest, fueled by rainbow stripes. 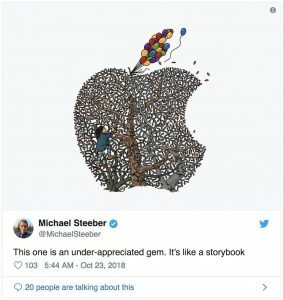 Michael Steeber, writing for 9to5Mac, notes that the design appears to be taken from the 1983 Apple Gift catalog. The rainbow design on these 1980s tees appears to serve as inspiration for new Apple T-Shirts available only in the Apple Park Visitor Store. Image from here. 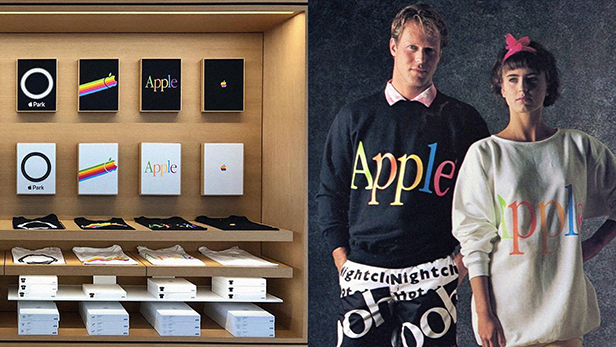 Perhaps the coolest, most iconic throwback looks are the shirts that read “Apple” in colorful Apple Garamond – the tech company’s preferred marketing font for three decades. 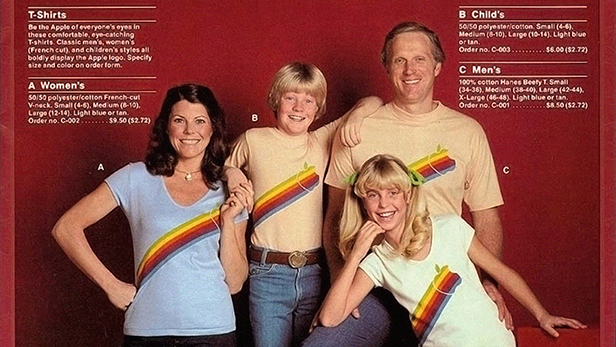 Steeber notes that similarly fonted shirts appear in the 1986-87 edition of The Apple Collection catalog. On left, new vintage-inspired tees featuring “Apple” text in throwback Apple Garamond font. On right, similar styles from the late ‘80s. Image from here. The new apparel collection at the Apple Park Visitor Center also contains contemporary designs. These include shirts decorated with Apple Park’s ring logo, which is patent pending, as well tees that say ‘Apple Park California 95014’ and ‘California’ – the latter bearing an “O” stylized to look like the ring logo. The modern styles are cool, but for us, the retro designs are where it’s at. From a promotional products perspective, the styles are another example of the growing trend among major brands to offer vintage-inspired merchandise to their fans. We saw that recently with ‘90s boy band *NSYNC and others, too. Perhaps the takeaway for promo pros is that at least some of your clients can tap into the retro trend to gain positive traction with desired audiences. As you contemplate that, we’ll leave you with an aesthetic uplift – this wicked sweet logo we’d love to see on some Apple merch.